Chinese Companies to offer jobs to Local Youth in inaugural career fair – Kenyatta University TV (KUTV). All Rights Reserved. A consortium of Chinese companies operating in Kenya are set for the inaugural career fair day at KICC in Nairobi. In an effort to attract future employees and build relationships with the Kenyan youth, Chinese companies, under their umbrella body, Kenya-China Economic & Trade Association (KCETA) and with the support from the Chinese Embassy in Kenya, have organized a day-long career fair event. The Career Fair is set for Monday 29th October 2018 and will attract some 90 Chinese companies in Kenya who will showcase their businesses and share available job opportunities, with the aim of finding employees with the skill set required. “It is our strong belief that in order to collaborate effectively, we need to empower the youth of Kenya. By doing so, we are empowering the nation and making contributions to the realization of the Big Four Development Agenda. The youth are the drivers of the Kenyan economy and it is therefore important that they attend the Career Fair and take advantage of such opportunities when presented to them,” commented Mr. Li Xuhang, Charge d’Affaires of the Chinese Embassy, when urging local youth to attend the career fair. Among the invited delegates to attend the Fair are: Dr. Amina Mohamed, Cabinet Secretary for Education, Amb. Monica Juma, Cabinet Secretary for Foreign Affairs, Hon. Ukur Yattani, Cabinet Secretary for Labour, Mr. Li Xuhang, Charge d’Affairs of the Chinese Embassy in Kenya, Mr. Guo Ce, Economic and Commercial Counsellor of the Chinese Embassy in Kenya as well as CEOs and HR Directors of local Chinese Companies. Hundreds of posts will be provided by Chinese Companies from various industries. They will set up booths on site to make detailed presentations about their companies, what they are doing in Kenya, and what job opportunities they have available. The CEOs and HR Directors of these companies will also conduct on site interviews for job seekers to help boost local employment. 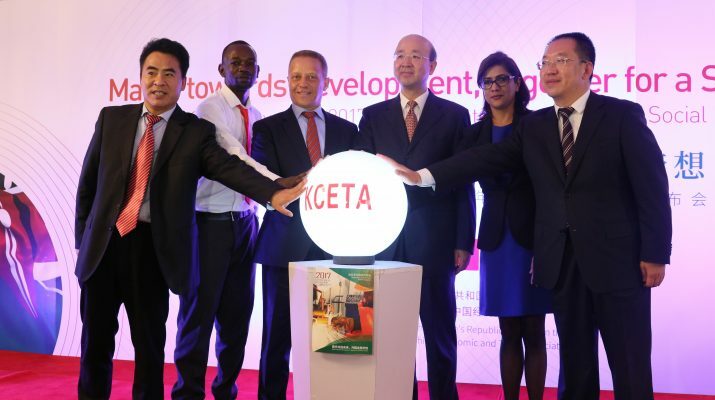 KCETA is a non-profit organization with 97 Chinese company members. The Association aims to explore business cooperation between Chinese and Kenyan people and enhance cultural exchanges, while actively shouldering Corporate Social Responsibilities to promote community cohesion.